As we enter the new 2013-2014 school year one can feel the excitement buzzing in the hallways. The school year is off to a great start and Ms. Finn, principal at FSSA, had a lot to say about all the changes our school is undergoing. As one walks into her office, the first thing you notice is the life sized cut-out of FSSA’s namesake, Frank Sinatra. Ms. Finn keeps it right next to her desk. Ms. Finn expressed much excitement over the new changes that have come to our school this year. One of the most talked about changes, at least among the students, was the addition of eight new teachers to the staff. From English and Social Studies to drama, film and science, many FSSA departments are seeing new staff additions this year. “I think they are going to help us bring the level of excitement about learning to a new level,” said Ms. Finn. Probably the biggest and most prominent change, at least to returning students, is the new freshman. While walking in the hallways and up the staircases it is not hard to believe that they are the largest incoming class FSSA has had in quite a while. Ms. Finn is confident the new additions to our school are ready to work on their studios and academic work equally as hard. “They seem to be very well prepared for the dual mission school that we have,”says Ms. Finn with a smile. Another major change within the school is the addition of FRANK (Focus, Respectful, Accountable, Neat, Kind) The ideas of FRANK can be found in the early pages of the student agenda book. 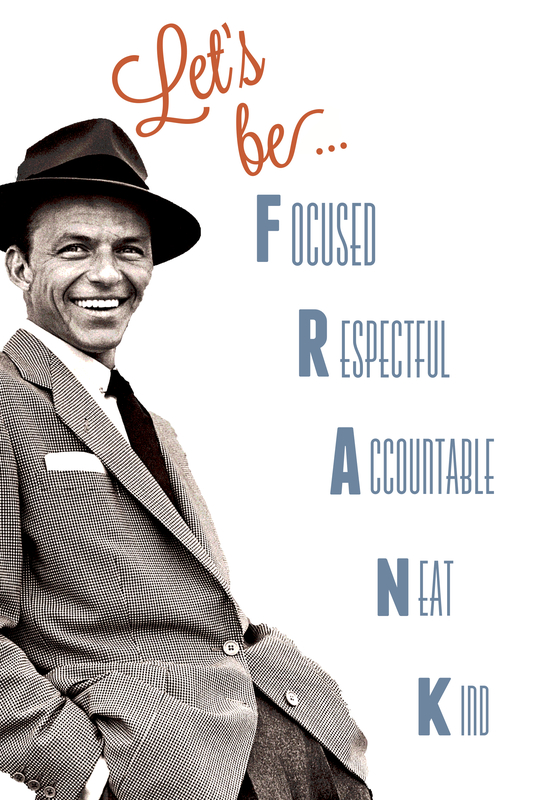 It describes how every student at Frank Sinatra School of the Arts should behave. Ms. Finn says that the staff and teachers are very excited about this development. She hopes it will encourage positive behavior within our school which she believes it is very important. Also, to add to the excitement there will be new posters hung around the school with all the ideas FRANK incorporates very soon. Ms. Finn also expressed much excitement for our senior class this year. She thinks they set good examples for our underclassman, and adds that they are in a unique position this year in terms of the graduation rate. “Usually our graduation rate is 95 or 96 percent. The seniors have the opportunity to be the first class to have a 100 percent graduation rate, and that is very cool,” she adds. Keep it up seniors and you can make history at FSSA.